Starting and running my soy wax candle business has been one of the most difficult but rewarding things I have done in my life. After making my first candle in my kitchen two years ago, I’m still finding my feet and trying to get to grips with the weird and wonderful world of candle making. 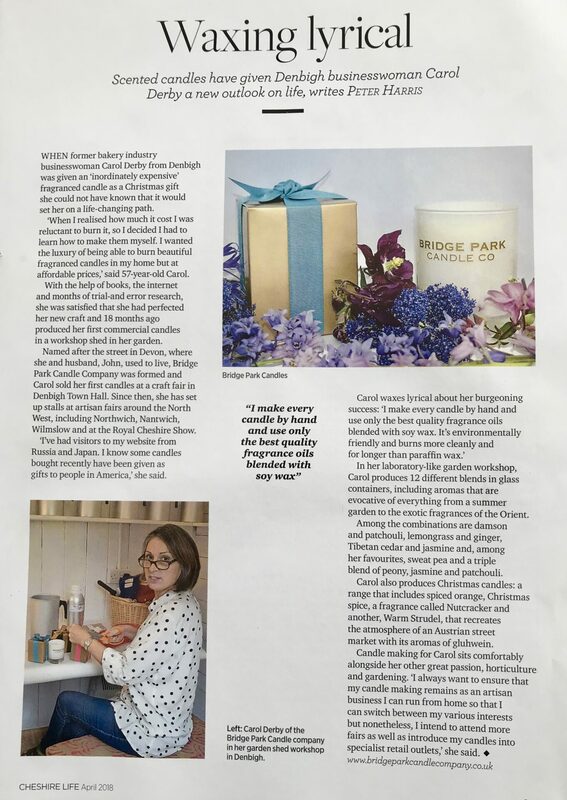 One of the highlights so far has been having an article about Bridge Park Candle Company printed in the North Wales section of Cheshire Life Magazine. After attending the Royal Cheshire Show last year I was approached by a journalist who subsequently visited my garden workshop in Denbigh, North Wales to interview me. I’m so happy that he did and am delighted with the resulting article.